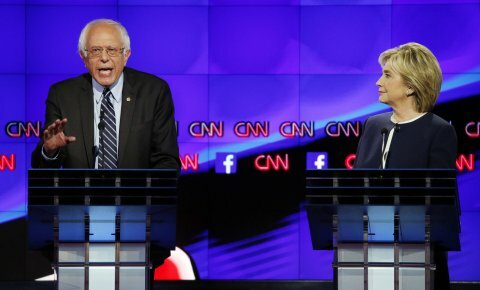 The media continues to declare Clinton was the winner of the Democratic debate, ignoring all those in the focus groups who considered Sanders to be the winner. This underestimates the benefits Sanders received from the debate in gaining greater exposure, increased fund raising, and probably new supporters. However this is how the debates work and Sanders has to play the game. Essentially we have the same pundits who downplayed Sanders campaign from the start declaring Clinton to be the winner. Unfortunately we cannot just write this off as media bias. Many people base their views of a debate on post-debate media coverage, and Sanders needs to keep this in mind when formulating debate strategy. The debate might have exacerbated Sanders’ long-standing problem. He is far better on the issues than Clinton,and would make a far stronger general election candidate based upon independents and the battle ground states. However Hillary is stronger among partisan Democrats–and unless Sanders brings in far more new voters than expected, they will determine the nomination. We run a great risk of Clinton winning the nomination, and winding up with a Republican president. I was concerned about Sanders’ unconventional debate strategy prior to the debate. Unfortunately we knew going into the debate that the mainstream media would call it for Clinton based upon matters of being a more polished debater and having the more establishment ideas, and the media would continue to downplay Sanders as they have from the start. They don’t seem to care about how evasive or dishonest Clinton was ,even if some reporters and the fact checkers have pointed this out. Debate winners have always been based upon how the media represents the debate. Bernie won the focus groups among those actually watching, but unfortunately that is now how it works. A candidate has to win the press coverage, and this does influence the polls. This was only one event, and not too much attention should be placed upon it, but the polls are showing that Clinton did get a bounce from the debate, at least among the Democratic base. NBC News, for example, reports Clinton Wins Debate, Re-energizes Core Backers. Bernie Sanders has picked up considerable steam among young voters, capturing the support of 54% of those under the age of 30 compared to Clinton’s 26%. Among Hispanics, Sanders has more than doubled his level of support, to 33%. He also continues to gain traction among those with a high school degree or less, although Clinton is still outperforming him by 18 points. Fortunately for Clinton, these groups do not tend to turn out in primary elections as strongly as the groups from where she draws her strength. I think that whether Sanders can win the nomination will come down to whether the big crowds he is attracting turn into actual voters who come out to vote for him. This also makes interpretation of polls more difficult as there is no way to predict how turnout will be among his supporters. Sanders can win if he brings in enough people who are fed up with the system to vote. Regardless of whether the first debate helped Clinton more, fortunately there are more debates (even if far too few). Sanders is a smart man. I bet he has figured out how the game is played with debates. Hopefully he goes into the next debate prepared with sound bites, prepared to more directly take on Clinton, and better prepared to talk about other issues (where he is right and Clinton is wrong) beyond economics. Democrats are making a big mistake if they think that a polished performance by Clinton in the debate has done anything to turn around her problems in a general election campaign. While many Democrats mistakingly think the party has a lock on the electoral college, winning the presidency for a third consecutive term will not be easy. I don’t think anyone can really predict what will happen, but in the past week an analysis from Ipsos/Reuters predicts a Republican victory. Clinton’s weakness among independents and in the battle ground states will make it very difficult for her to win the general election. Sanders received some momentary praise for defending her, but he was wrong. As Philip Bump pointed out after the debate, only Democrats are sick and tired about hearing about Clinton’s email. Independents do care, and this will hurt her in a general election. As The Washington Post also noted, this is not a problem which is going to go away. While it received applause before a partisan Democratic crowd invited by the DNC, Sanders would have been much smarter to have both denounced the Republicans for playing politics with their Benghazi witch hunt, and criticizing Hillary Clinton for her violation of the rules and unethical behavior as Secretary of State. It shouldn’t have been necessary to wait for the fact check articles to point out how Clinton was repeating the same lies she has been telling for months about the email. If Sanders had his way, he would talk only about income inequality and economic policy. It is possible he might not even be aware of the facts related to the Clinton scandals. This is not how to win a campaign. Sanders needs to be prepared to defend transparency in government and criticize Clinton for her abuses. He also needed to be even better prepared to criticize her for her support for greater military intervention in Libya and Syria. He needs to oppose her more strongly on civil liberties and social issues. He must defend his position on guns, both supporting rational gun control and respecting the rights of hunters, as part of an overall difference between Sanders and Clinton on civil liberties issues. He must make more out of his support, and Clinton’s opposition, to expanding Social Security. He needs to continue to discuss climate change, along with pointing out the weakness of Clinton’s environmental record. While the economy is important, Sanders cannot look like a single-issue candidate. Even when talking about the economy, he needs to be better prepared to explain during a debate just how much can be done by increasing taxes on the top one percent. He needs to discuss the socialist ideas which many Americans take for granted, while stressing reforming but not eliminating what is good about our capitalist system. Posted in Bernie Sanders, Civil Liberties, Democrats, Economy, Foreign Policy & National Security, Hillary Clinton, Iraq, Politics, Polls, Scandals, Social Issues. Tags: Benghazi, Bernie Sanders, Hillary Clinton, Iraq, Libya, Scandals, Social Issues, Syria. RSS feed for comments on this post.. TrackBack URL. I think you have a mistake in the first sentence. The media has declared Hillary the winner. Edited to note a few other trivial errors were fixed, including completing the last sentence of the first paragraph which somehow got cut off with cutting and pasting. I also updated the post with additional links and information for cross posting it at The Moderate Voice. I think he needs to button his jacket. Look presidential. He HAS to play the game. He needs to stop saying we should be like so many other countries. He needs to word it DIFFERENTLY. He needs to say, yes, we have a capitalistic economy which is tempered with democratic socialist programs, which we have already, but need to be improved. I have a feeling advisors MAY have suggested some of these things already, but I suspect he may be stubborn… to his own detriment. I am an avid supporter and am only saying these things to help the cause!